I DX a lot outside, whether on the road in a vehicle or just to be outside and away from the extreme household noise that we find today. Whether you be a mediumwave DXer, shortwave DXer, or DXer of another kind, the problem in DXing away from home has always been the lack of ready DX reference materials nearby. You have to pack and carry all that stuff. And I like to travel light. My outdoor DXing is often casual and spur of the moment, with a ULR or portable. Who might that weak station be under KHOW-630? I need a station reference. At minimum, a reference guide of stations helps you to know what to look for and what to expect, so it is important to have one close by. In recent years there were two common radio DXer guides in bound-book form, the World Radio TV Handbook (WRTH) and Passport to Worldband Radio. I used to buy them faithfully every year. Passport had a great radio review section, but its station reference only covered the shortwave bands. Passport also folded last year and ceased publication. It was a great shortwave guide. 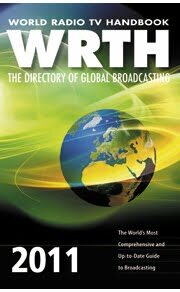 WRTH covers longwave to 30 MHz and also FM and TV, listing nearly every broadcast radio and TV station a country has. Unfortunately, its US mediumwave coverage is not complete, in that it doesn't cover many lower powered and graveyard stations. The information is scant, basically only station addresses, power, and antenna type. The recent list price: $35.00 per issue, though it can be had at a discount later in the year. That's a lot of dollars for a little bit of usable information if you are just interested in mediumwave. The National Radio Club publishes its AM Radio Log every year, and it's a winner. The current, 32nd edition of the log contains some 300 pages in 8.5 x 11 inch size, 3-hole punched, in U.S. loose leaf format. Current cost is $20 for members and $26 for non-members. The NRC also publishes an Antenna Pattern Book, helpful in determining which direction stations are favoring in their broadcast pattern. The current, 6th edition (late 2005 data) is 238 pages containing both daytime and nightime patterns for stations in the US, Canada and parts of Mexico. It is in the same format as the AM Radio Log, and is designed to be used as a companion to it. The "book" fits in a 1 inch three ring binder. The current cost: $17 for members and $23 for non-members. We are starting to accumulate a lot of paper (500+ pages so far). And the cost is going up. As you can see, reference guides can be expensive to buy. They also go out of date quickly. Thirdly, they can be heavy and take up a lot of space. We are back to the packing and carrying problem. In the article, Radio Station Databases 101, we explored several countries' mediumwave databases which might help us in creating our own lists of mediumwave stations to aid us in our DX quests. However, database information is not generally in a readable format. In most cases it is hundreds or thousands of lines of incomprehensible textual data. It is mainly useful to the software hobbyist who might want to write a database program or create an XCEL (.XLS) file to display station information in various sorted forms. This is obviously a highly technical and tedious endeavor which most people are not equipped or trained to do. My own project in this area is the Radio Data MW program. I will write more on this project at a later date. Thankfully, a number of web sites exist which have done much of the work for us, tabulating this data and presenting it in one form or another which can be useful as a reference. These web pages, or in some cases, files, can simply be printed and placed into a binder of some sort, then used in your shack or carried to an outside DX location and used there. We have at least saved cost, though not paper. Let's explore what's available for free on the web. Pre-eminate in the field, the FCC maintains an AM Query web page that utilizes and searches its standard database for all US stations - AM, FM, and TV, as well as Travelers Information (TIS) stations. I have found the FCC information for US stations to be highly accurate. Be wary of Canadian and Mexican information. Much of it is either redundant or out of date. Properly used, the FCC AM Query will output a large text file of all MW stations. Opening the web page and selecting the dropdown boxes, "Authorization type: Licensed Records Only (Daytime + Nighttime" and "Output-- AM Short List (or AM List)", then clicking the Submit Data button returns a huge list of active stations. Save this to a file, print it, and you have the entire US mediumwave listing. But it is huge, some 8 megabytes in some cases. You can also search by frequency or state, thus you can create customized lists, saving and printing them. The FCC also makes antenna pattern plots available. Virtually all stations with multiple towers have directional patterns and the FCC makes this plot available in PDF form. Once displayed in your browser, this PDF can be saved to a file for future reference. Pull up the page for the station of interest to get to the pattern link. Example: WWKB-1520 facility and WWKB-1520 pattern. radio-locator.com, a favorite site of mine, also has an advanced station search page. Many of us think of radio-locator only as the site that shows us mediumwave antenna pattern plots. The great thing about their page is you can also plug in parameters to filter stations by frequency or state. You can even search by broadcast format. Results are returned in formatted HTML pages. Save the resultant pages to file, print them, and create your own database of stations. As just stated, radio-locator.com is another site which produces antenna pattern plots. These particular plots depict the expected signal coverage area of the mediumwave station over a map. The pattern plot is displayed as a GIF image. Once displayed in your browser, this GIF can be also saved to a file for future reference. Example: WWKB-1520 pattern. am-dx.com is a simple textual site that tallies all US stations by frequency. Canada and Mexico are also available. Pick a frequency, display the list, save it, then print it. The AM Logbook by Lee Freshwater is another interesting site that lists stations in a myriad of ways. Frequency, call sign, state, city, sites (transmitter), slogan, etc. Again, select your preference, display the list, save it, then print it. US and Canadian stations are represented. AM Logbook also provides its current AM database in spreadsheet (XCEL) format. You must of course have an XCEL (.XLS) viewer. You'll find the link on the Updates page. Topaz Designs is a basic textual site with search box, returning results by frequency, state, power cutoff (100W), and broadcast format. US and Canadian stations are represented. Mediumwave List is a comprehensive site that offers a lot of information, including transmitter mapping, logbooks of users, and station news. Worldwide mediumwave stations are represented, including of course North America - Canada, Mexico, Cuba, the Caribbean, etc. To create your station list, login if you are a member or click "Continue as guest". This site will also allow you to download files from their huge database of stations, by region or country. The output is in PDF form. Registration is required for certain information beyond the basic. Outside of the US, the Mexican government provides a very nice list of their mediumwave service in PDF form. Australia provides a list of their mediumwave service in XCEL form. Using the Industry Canada site, you can search the Canadian mediumwave service and create various lists in text, HTML, and XCEL form. Note that most of these sites return station lists in a web page (HTML format) versus a simple text page. Lists can be saved as a web page by the Save As function in your browser. But there is also another way. It is possible to select the important data on the web page, copy it to the Windows clipboard (CTRL+C), then paste it into a text editor (CTRL-V). The text can then be saved as a text file, which may require a little editing. Sometimes it is easier to read this way. If you go this route, be sure to use a text editor that supports Unicode text format, like Window's Wordpad, Notepad++, etc. Window's Notepad does not, and you may get a jumble of text with no line breaks. So, we have several options available for saving and/or printing station lists. We have two options available for saving and/or printing antenna pattern plots. If you choose to print some or all of these and place the pages in a binder of some sort, all well and good. But a comprehensive list of the entire US database is still a lot of paper to store, pack, and carry around. Of course we could just save all these files to a laptop and take the laptop with us. There is also one another option. Such a nice thing you had provided here. Thank you very much for this one. And i hope this will be useful for many people.